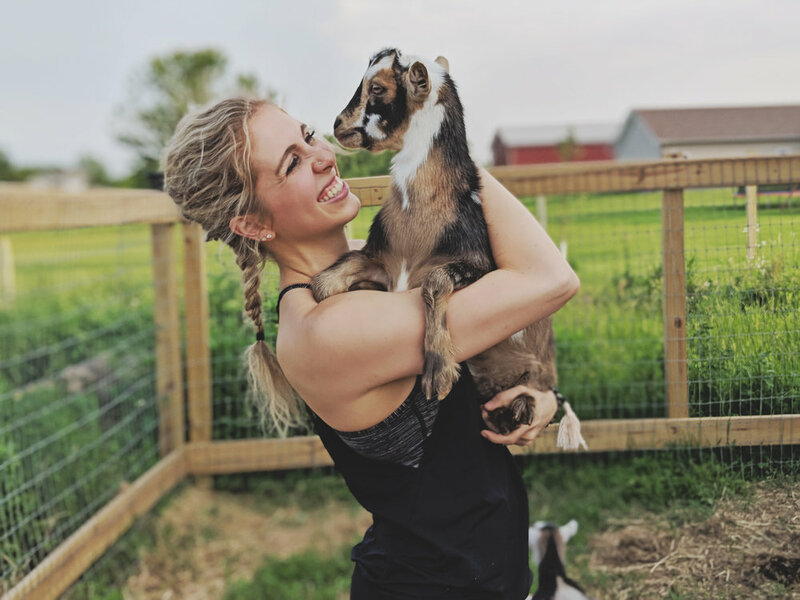 Located in Nowthen, Minnesota, Wildroot Goat Yoga brings the goats to yoga. Each class has been a memorable experience full of laughter. Want to know more? Follow us on Instagram and Facebook to keep up with the most current events and discounts! RYT Mazie Gengler leads us through a 60-minute Vinyasa Flow Goat Yoga class. Professional photos are taken during and after the class (so you can prove you did it!). Goat yoga classes are scheduled throughout the spring and summer months. Note that classes are limited to 24 participants and fill up quickly. An exclusive Wildroot Goat Yoga design - these flattering tanks and t-shirts are available for purchase. We try to keep a variety of sizes stocked at class. You can pre-order a top by contacting us through email - wildrootgoatyoga@gmail.com. Wear your WRGY apparel to class to receive a gift! Whether you are planning an outing with your co-workers, a family gathering, a bachelorette party or a girls night out, we promise that goat yoga is a great activity that will make for a memorable time together. Bringing human kids, goat kids and yoga all together! So… Goat yoga is a thing? Yep! And we were skeptical about it, too. The truth is we decided to give it a try and we found that it was such a fun and memorable experience. Goat yoga is unique in the way that two strangers will laugh together like they are best friends. Mazie leads the class into Vinyasa Flow in a peaceful, country environment. The goats bring the entertainment by interacting with yogis and at times, jumping on them – it is a great balance between peace and laughter. Want to know more? Be sure to check our Goat Yoga Details page and follow us on Instagram or Facebook. For those that know her, Mazie is the type of friend that will send regular texts to invite others to join her in her fitness journey. She loves helping others become the best versions of themselves by feeling healthy and confident. You don’t have to know Mazie personally, taking a class with her will not only make you feel comfortable at any fitness level you are currently at, you will also feel like you’re hanging out with your best friend. Mazie is perfect for goat yoga because she happens to be a lover of all animals. Mazie is passionate about educating the youth about yoga and mindfulness. Her day job is at a children’s hospital in the cities so she is a professional when it comes to engaging with kids of all ages. Miss Mazie was also a swim and dance instructor and taught kid lessons for four years. Mazie has a 200 Hour Power Yoga certificate from CorePower Yoga and is also CPR certified. As a wife, mama, homesteader and designer, Tara understands the necessity of emotional, physical and spiritual balance not only for your well-being, but for your loved ones. 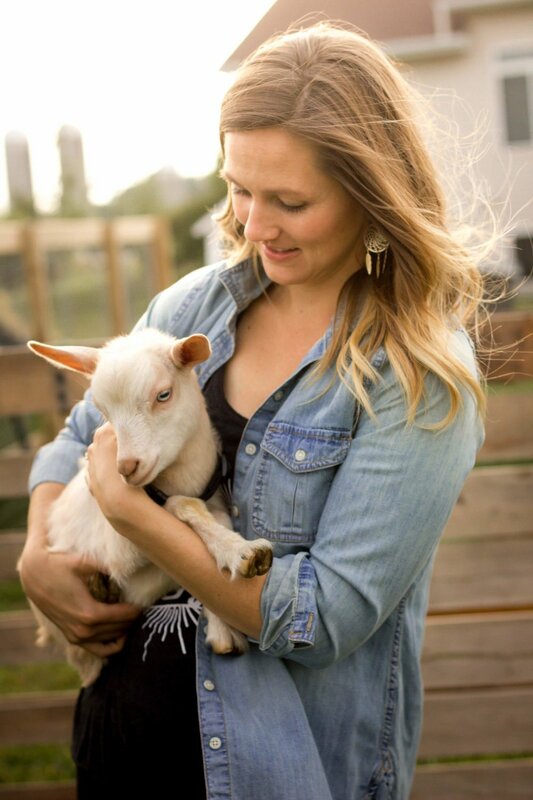 As a goat yoga host, Tara will guide the animals through the session based on each participant’s comfortability with animals. Tara is a natural mother to all beings, she is currently raising a 5-year old daughter, instilling values of selflessness and independence. Tara and her family maintain the property at Wildroot Cove to create a peaceful haven. Their hope is that when the session has ended, visitors will leave feeling replenished compared to when they arrived. You will find the address is not listed online for safety of the WRC family. Once you register, we will send you a Welcome Letter that has the address. We are located in Nowthen, Minnesota (a cute little city east of Elk River), approximately 35-minutes northwest of Minneapolis.